Are you looking back over your credit card bills and realizing that you went a little overboard with your spending? This is a common affliction after the holidays end and a new year is underway. If you want to break out of the cycle and avoid holiday debt next year (and in the years to come) it makes sense to plan ahead. Everyone you’ll give a gift to, and how much you’ll spend on each. Cards and postage, if applicable. Entertaining, including food, drink, special clothing, child care, and other costs that come with throwing and attending parties. Year-end tips for newspaper carriers, babysitters, housecleaners, delivery drivers, and other service providers. Gifts for teachers, neighbors, and others who are close to you. Figure it all out so that you know what to expect. 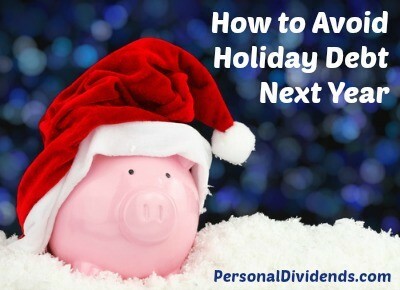 You can use the spending from the holiday season just past as a guide. He also suggests that you be creative. If you know you can’t afford a lot of expensive gifts, you can offer homemade gifts, or gifts of time and effort, instead of those that cost a lot of money. Take what you plan to spend, and divide it by a number that makes sense. Gallegos suggests 12, but it might make more sense to divide it by 10 so that at the end of October, you’ll have what you need for your holiday shopping already in the bank. “You can either save it, but putting it into a money market account, or use some each month to get ahead of the curve,” says Gallegos. Studies indicate that shopping during Black Friday and the rest of the holiday season might not be the best option for the best prices anyway. There are many times throughout the year that you can get the same deals — or better deals — on many of the things on your holiday shopping list. Break out of the mindset that says you have to buy during the holiday season. At home, a dedicated space for gifts and other holiday items can help you keep everything organized. Make sure that you record everything, and that your money is shifted around between accounts to reflect the holiday purchase.